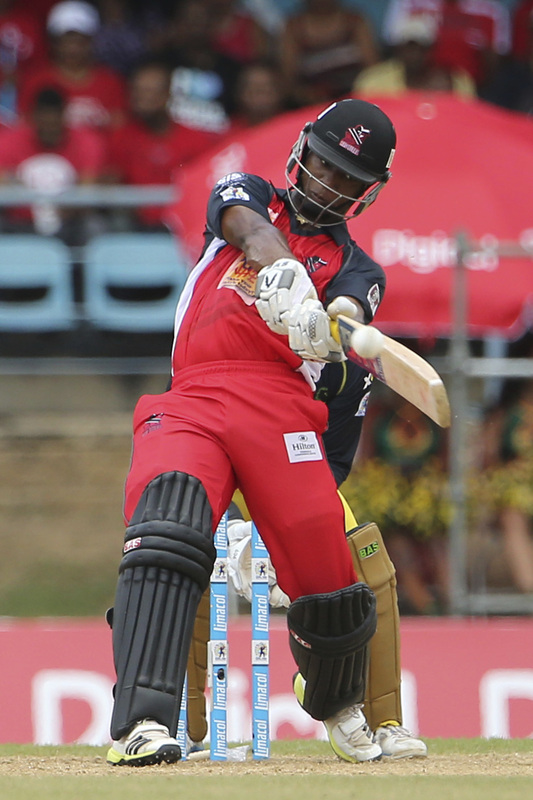 Opening batsman Evin Lewis' belligerent assault paved the way for Trinidad & Tobago Red Steel's 13-run win over Jamaica Tallawahs at a vibrant Queen's Park Oval on Saturday. Lewis' 72 off 43 balls left the Tallawahs stunned in the field and resulted in their first loss on the season while the Red Steel moved past the Tallawahs on the CPL points table with their fourth win of CPL 2014. After Chris Gayle won the toss and elected to field, Kevin O'Brien got the Red Steel innings off to a brisk start with three fours and two sixes to push the score to 40 for 0 after four overs. Andre Russell pulled things back in the field for the Tallawahs with a double-strike in the sixth over, cleaning up O'Brien for 32 with a yorker before dismissing Ross Taylor for a first-ball duck courtesy of Rusty Theron's well-timed leaping effort to take a one-handed catch. After eight overs, Lewis had yet to hit a boundary and sat on 8 off 20 balls but he erupted in the ninth, targeting Gayle's offspin for two fours and a six. Gayle remained in the crosshairs in the 11th when Lewis launched him for back-to-back sixes over long-off. The captain replaced himself with Daniel Vettori's left-arm spin in 13th but the result wasn't much different as Lewis tonked three sixes in the over, two playing with the turn over midwicket followed by another back over Vettori's head. Theron eventually claimed Lewis in the 15th but not before he had hit eight of the Red Steel's 15 sixes. Three more came in the final over from Dwayne Bravo and Javon Searles to boost Red Steel's total to 183 for 5. The Tallawahs got off to a methodical start in the chase with Gayle's half-century anchoring the innings. They comfortably reached the halfway mark at 82 for 1 but a few overs later O'Brien's spell turned the match back in the Red Steel's favor. He struck four balls after his introduction in the 12th over, inducing a skied chance to cover that removed Jermaine Blackwood for 28. After Gayle smashed O'Brien over extra cover for six two balls into the 15th, he tried repeating the shot but a miscued drive was claimed by Taylor a yard inside the boundary. Adam Voges crossed to get on strike for the following delivery but quickly joined Gayle in the pavilion when he produced a leading edge back to O'Brien to leave the score 121 for 4 after 15. O'Brien pushed Lewis out of the way for the Man-of-the-Match award by trapping Owais Shah on the back foot with an offcutter at the start of the 17th and finished with figures of 4 for 22 in three overs. The Tallawahs entered the final over needing 33 to win and Carlton Baugh was run out trying to steal a bye off the first ball to mathematically clinch the win for the Red Steel. Russell smacked sixes off the final three balls of the match to make the result appear more flattering for the Tallawahs but the day was dominated by Red Steel behind Lewis and O'Brien's impressive performances.